Contrary to what my most recent set of posts might lead you to believe, I don’t subsist entirely on a diet of bread, cake and pastry. I’ll admit to having a sweeter tooth than most, and finding few meals complete without some kind of sweet treat, but that’s not to say there isn’t a place for all things savoury in my heart. Having tempted you with treacle tart and toffee cake, macarons, profiteroles and numerous types of ice cream in recent weeks, it felt about time to test the water with a slightly less sugar laden recipe.A couple of weeks ago the lovely Jules (I sound like Jamie Oliver…) of The Butcher, The Baker asked if I’d like to attend a swanky launch event at The Berkeley in her place. Unfortunately I couldn’t go, but a couple of days later I received an email from a PR person for Farmison, the brand new online retailer for whom the event had been held. As I hadn’t been able to experience the meal at The Berkeley, would I be interested in sampling some of their products instead? Having scrolled through their site and read Mark Hix’s endorsement of this ‘foodie haven’, I was pretty much sold on Farmison’s ‘exclusive artisan’ proposition, so decided to give it a try. Forty eight hours later a giant white box lined with cooling gel and packed with hay arrived at my office, containing a Disney film’s worth of game; deer (sorry, venison haunch – I got stuck on the Bambi theme), rabbit (Thumper…) and a pack of ten tiny pink pigeon breasts. A reformed vegetarian, I’m still learning about different cuts of meat and how to cook them, so I loosed off an email to a slightly larger – and equally food obsessed – loaf (my Dad) to ask for his expert advice. The result is a menu to satisfy the meatiest of eaters. 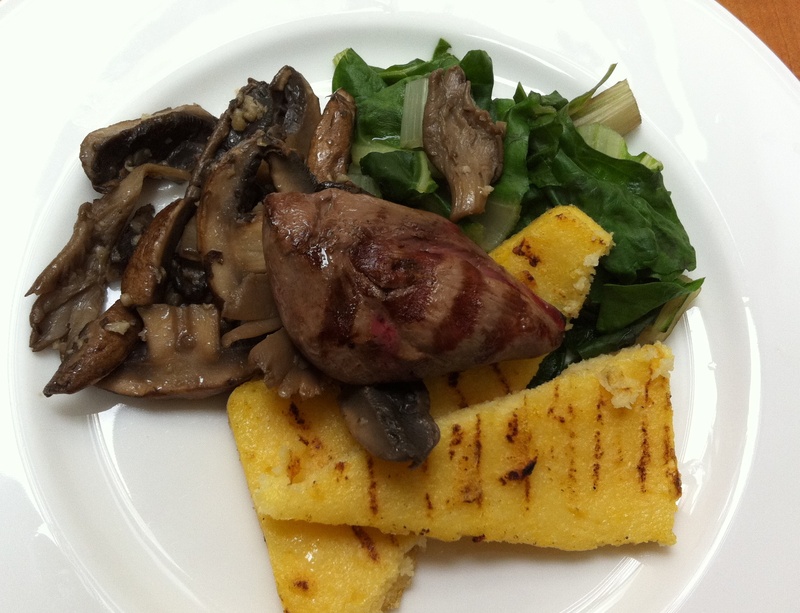 I’d normally recommend serving two pigeon breasts per person, along with the various accompaniments (in this instance char-grilled parmesan polenta, garlicky wild mushrooms, earthy chard and a puddle of gravy), but with only ten in the pack I didn’t have quite enough to feed the hungry hoards arriving for Sunday lunch. To make ends meet (and wanting an excuse to try it anyway), I decided to cook the venison at the same time, marinating the meat in a mixture of red wine, orange zest, thyme and juniper berries before roasting briefly in a hot oven and serving in thick, juicy slices as a kind of carnivorous side dish. The game provided by Farmison was fresh and full of flavour, particularly the dark red meat of the pigeon with its steak-like qualities. I left the venison to rest a little too long as you can see from the picture, but the meat was still tender, juicy and a delicious alternative to more traditional roasting cuts. I didn’t pay for the pleasure of receiving this treasure trove of meat, so can’t pass too strict a judgement on the prices. Suffice to say they’re not cheap, but the quality is definitely there, and when you’re paying for trusted and top notch suppliers as well as door-to-door delivery service, I guess that’s to be expected. 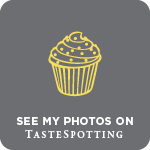 I’m not normally a fan of shopping for food online – I like to shop by sight and chat to a butcher I know and trust – but equally completely understand the convenience of a service like this. 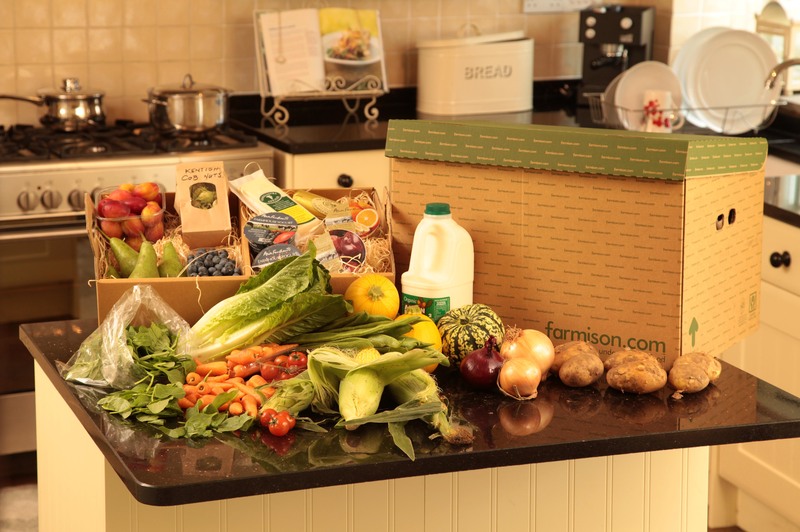 And while I wouldn’t want to put local businesses out of pocket, you could argue (and they do) that Farmison is actually doing its bit for independent suppliers by providing an online shop front with nationwide access for farmers who might otherwise be very limited in their reach. With people living ever more hectic lives, online shopping now accounts for over 10% of all retail sales and seems to be a fact of modern life we just have to accept. And if it can be done as thoughtfully as responsibly as Farmison are doing it, then I’m all for it. Do you do any of your shopping online? Are you concerned about where your meat comes from? And do you have any suggestions for what I can do with the rabbit now residing in my freezer?! This is less recipe, more recommendation; quantities are specifically a little vague so you can scale them up or down depending on the number of people eating and the size of their appetites! Cook the polenta, remove from the heat and stir in a handful of parmesan. Spread evenly on a tray and allow to set. When ready, cut into strips, brush with a little olive oil and grill on both sides until nice and charred. In the meantime, crush a garlic clove into a large pan with a knob of butter and drizzle of olive oil. Fry some wild mushrooms and a few sprigs of thyme until softened and delicious. Steam a few handfuls of chard. Season the pigeon breasts generously with salt and pepper – I’d allow a couple per person or three if they’re really small – then sear in a large pan with a little butter for about 2 minutes each side (be careful not to overcook, you want them nice and rare). Allow to rest around five minutes, then plate up alongside wedges of grilled polenta, a pile of garlicky mushrooms and a heap of earthy chard. Drizzle with a little homemade gravy (I used one I’d made to go with the venison), red wine reduction or truffle oil, and serve. Nice write-up. When it comes to meat, I too like to see and feel what I’m buying and look the person who’s selling it to me in the eye. But it looks like you triumphed with the free (!) box. Well done. I’ve seen a couple of those places which sell weekly/monthly meat boxes and have always been intrigued by the idea but I’m just not sure we eat enough meat to justify the cost. I love pigeon though so and this looks like an absolutely delicious recipe! Oooh I love pigeon breasts. I love how dark and delicious they are, especially when seared to perfection on the outside and still really bloody within. I made a wild mushroom risotto to accompany some once…divine. Well that’s good since that would be in no way a balanced diet 😀 That pigeon looks delectable and that venison almost as good – if only it had been a little pinker, but at least it’s not cremated! The flavour must still have been there. I would love a box like that! I wonder if they’ll send it to Belgium Though. Being a reformed vegetarian I know the feeling of still exploring new cuts of meat. For me the heritage/life the animals had is prime! Susan – it was amazing to receive this treasure trove of meat…still planning what to do with the rabbit but am thinking a rich ragu for pasta. Elly – can imagine mushroom risotto with pigeon breasts would be wonderful – creamy smooth risotto and that rich, bloody meat. Yum. 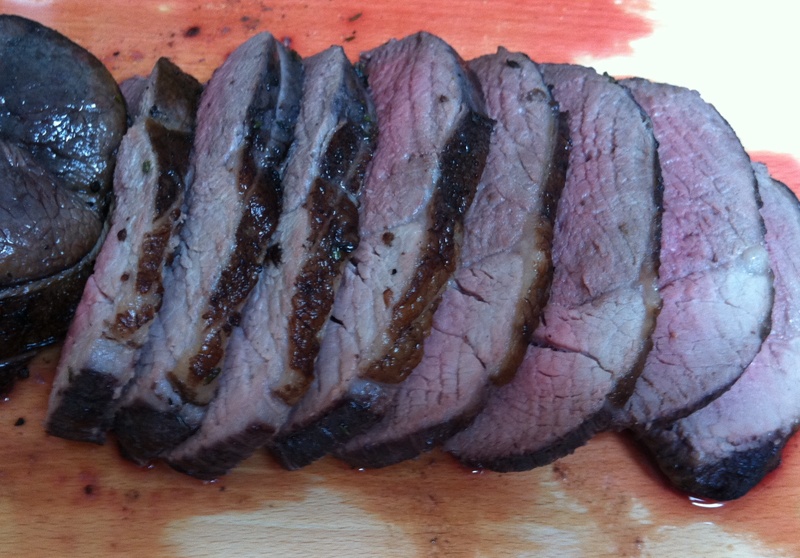 Frugal Feeding – the venison was perfect when I first carved it. Sadly I left it resting about 5 minutes too long as I faffed around with the other dishes, otherwise it would have been spot on. Foodwise – where my meat comes from is so important to me – if I don’t trust the source I’d rather not eat it! that looks like restaurant-standard fare! I’ve yet to try pigeon before.. but that really looks like a very very good reason to try. i haven’t really used any of the online meat retailers. My mum got a taster box from The Well Hung Meat Company and neither of us were impressed. That put me off not being able to see the meat first, but I’m dying to try one of those exotic meats people. I fancy a bit of springbok or wildebeest or something! I can’t eat game..just can’t do it. I’ve been tricked many times, but I always picked up on the ‘gaminess’ before I’m told. However, your juicy pigeon breasts I don’t consider game, and would eat..they look pretty amazing! I would definitely dig in if it was placed in front of me. I’ve had whole squab and loved it, but in that case, it’s the teeny, tiny little body and bones that bug me LOL As for shopping online for fresh meats or fresh foods in general, it depends on whether or not I can find the same quality offline. Shu Han – definitely try pigeon. I first had it roasted whole in Trullo in North London and fell in love with its juicy, meaty qualities. Amy – do give venison a try…it’s quite gamey, but a delicious lean meat and great as an alternative to steak. Lisa – I’m not a huge fan of gamier meats either, but love pigeon…it tastes very similar to steak to me! I like the idea of grilled polenta. What is the texture like?